Bob Dolphin of Yakima and Renton, Washington, in the United States of America has been running marathons since 1981. On September 2, 1991, at the age of 61 he ran his 100th marathon, ten years to the day after running his first marathon on the same course. This was the Heart of America Marathon at Columbia, Missouri. The 1997 London Marathon was his 200th. While in London he met Brian Doherty who inducted him into the 100 Marathon Club UK as the first American to be added to the club's membership rolls. 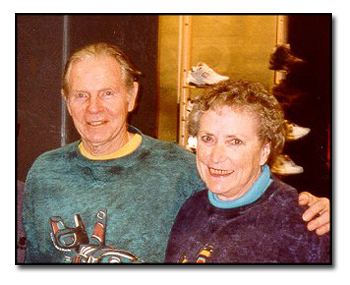 With the encouragement of Peter Graham of the 100 Marathon Club United Kingdom, , Bob formed the 100 Marathon Club North America at the inaugural YAKIMA RIVER CANYON MARATHON on March 31, 2001. He and his wife Lenore are co-directors of this marathon and of the 100 Marathon Club NA. Bob ran his 300th marathon (including 44 ultras) at the Royal Victoria Marathon on Vancouver Island of British Columbia in Canada on October 13, 2002. By December 23rd 2007, his marathon/ultra count reached 395. Bob ran his 400th marathon on March 31, 2007and his 500th on March 31, 2012, at the Yakima River Canyon Marathon..Bob runs 20-22 marathons each year and an equal number of shorter races and relay legs. His training is frequent 1-2 hour hikes and occasional five-mile runs.. His marathon personal record is 3:00:12 at age 58.He is a member of Marathon Maniacs, Marathon Achievers, 50 States & DC Marathon Group, 50 States Marathon Club, three 100 Marathon clubs (UK, Germany, NA) and seven running clubs in Washington, Oregon and Missouri. He was in the U.S. Marine Corps for 6 1/2 years, reaching the ranks of sergeant and first lieutenant. After earning a PhD from Purdue University, he worked for the U.S. Department of Agriculture for 23 years as a research entomologist, associate area director and laboratory director until he retired in 1988. Lenore and Bob have five children, 14 grandchildren and 9 great grandchildren.